There are three former James “Whitey” Bulger colleagues who will testify against him in this trial. John “The Basin Street Butcher” Martorano went on record to say he committed some 20 murders with 11 of them involving Bulger. The prosecution put Martorano on as someone with a firsthand account of Bulger’s violence and potential to commit murder while the defense painted the former hitman—a term he rejects—as an opportunistic killer. Bulger himself is on trial for 19 murders during the 1970s and 1980s in addition to over 30 charges of racketeering and extortion. Martorano spent his third day dueling with the defense’s Hank Brennan who continued to chip away at the Butcher’s account and his integrity. After all, he did mention he was testifying as revenge for Bulger dealing with the FBI as an informant. It seems as though to get that revenge, he had to become an informant himself. He also confirmed in the affirmative that he dealt with the FBI as a means to get a deal—the same as Stephen “The Rifleman” Flemmi whom he also touch on in the first two days on the stand. Brennan brought up that Martorano also lied to his one-time best friend—John Callahan—who was later murdered in Florida. In short, Bulger’s defense painted Martorano as a sociopathic liar who dealt with the government to cut his sentence by two years. 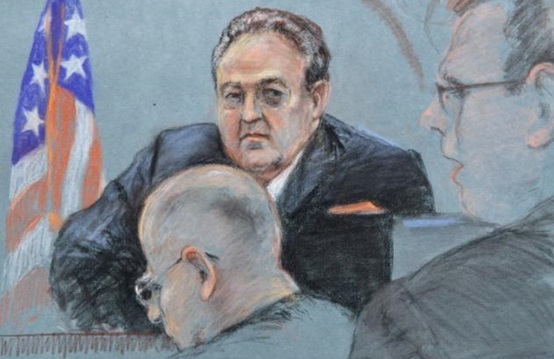 J.W Carney Jr., the lead attorney for the defense left the jurors with “they basically threw their hands up in the air and said, ‘Take anything you want’” in regards to the deal that was brokered. Jumping to Friday, victims take the stand and talk about surviving hits from Bulger. Frank Capizzi is a 78 year old former criminal who was given immunity by U.S District Judge Denise Casper if he confessed in the trial. He stated that he had some sort of medical condition which results in him sometimes hearing plain English as Sicilian. Capizzi said that he believed the shooters that wounded him March 19, 1973 were a part of the Winter Hill Gang and that some 100 bullets hit the car. Of the medical effort to patch him up, he stated that doctors managed to extract 11 bullets in four hours, but there were many bullets left inside him. In his own words, “I was imbedded.” Capizzi later left Boston for his own safety. The prosecutors also brought out assault weapons, World War II machine guns, and revolvers. Ballistics experts stated that the guns were taken from the Winter Hill Gang and associates. Diane Sussman de Tennen—who went on first—was shot in the arm and said that her boyfriend at the time, Michael Milano, was shot in a hit a little under two weeks prior to the incident with Capizzi. She stated that a car pulled up beside them while at a stoplight in North End. “It was just nonstop,” Sussman de Tennen said in describing the gunfire. These were people caught in the crossfire of gang violence. Nancy Ferrier told of a call about her father, Al Plummer being shot in the face. At first it was stated that he survived, but she later found out that he was dead on arrival at Massachusetts General. She was 14 at the time. James Bulger escaped Boston in 1994 after being tipped off by a corrupt FBI agent that he was being brought up on RICO Act charges. He was on the run for 16 years, appearing in Canada and Europe and eventually being captured on the west coast of the U.S almost two years ago on June 22, 2011. Bulger pled not guilty to the 19 murder charges as well as the 30 other charges. He also stated—through his lawyers—that he was never an informant and that he merely used FBI agent John Connolly for information. Martorano stated that Bulger was in fact an informant for FBI at the time. The FBI went on record to state that James Bulger was an informant for him. Whether through his on-record involvement as an informant or through a corrupt agent from the old neighborhood, Bulger and his group benefited from whatever the FBI was doing and it allowed them to do as they wished for years up until the early-1990s. To combat Bulger’s claims of not being an informant for the FBI, the prosecution is getting ready to turn in the 700 page document built over the years that shows Bulger did work with them. The defense will want to shoot holes in the FBI’s account, but it might prove a bit difficult. Shredding a former criminal’s account is different and definitely easier considering their background. In the case of the FBI, while they probably had to do some dirt with Bulger and company, they most likely didn’t include anything incriminating on their end—even if they did cross the line such as murder and dealing drugs. Vaguely case related was Robert Duvall—who played Tom Hagen in the Godfather trilogy of films—was in attendance to view the court case. Apparently he’s involved in filming in the area and had time off from set.